PLEASE DO NOT SUBMIT PHOTOS BIGGER THAN 400 KB. 3. List your agency’s name if you have one or note that you are seeking an agent. 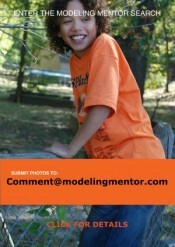 Sign Up for the monthly Modeling Mentor newsletter to be the first to find out the winners! If you win Model of the Month, have your friends “like” your page on Modelingmentor.com/blog (and share on social media to spread the word!). These likes will determine the People’s Choice winner and serve as a tie-breaker if needed. A panel of industry experts will review the finalists and vote on Model of the Year. This is your chance to be seen by movers and shakers in the modeling world and get guidance from me, your personal modeling mentor, and top agents! Past winners have landed top agencies in New York, L.A., and London, and lucrative contracts to Asia. Good luck!